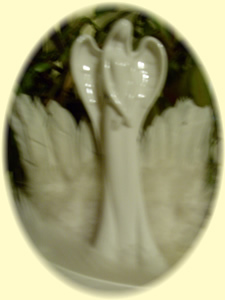 Tune into your inner guidance- angel guidance - spiritual guidance- through sound vibrations of the creative alchemy of voice and my unique soundingbowl. The aura readings give insight into: underlying feelings- intuition – past recall – circumstances – direction – cause and effect – touching the imagination. Raising awareness of your spiritual self, which takes you on a sound journey of self-discovery. The aura Readings create a shift within the auric field and help refine and realign the subtle energies within the aura itself. Clients speak of sometimes experiencing visions of a past life, thus seeing into their records of who they are that are recorded within the aura. To having messages from their guardian angel, and sometimes seeing them. People speak of meeting their spirit guide or guides and of ancestors appearing to them with subtle messages. The alchemy of sacred sounds that manifest in the transmissions take you on a sound journey, a gateway into your subtle dream bodies, and senses and align with your own unique vibrational frequency of resonance, where your conscious mind is elevated to your subconscious mind, heightening your state of awareness. 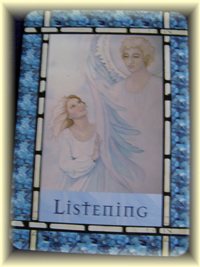 During the aura reading, as I continue to hold the sacred space of communication for you, you will also have the opportunity to engage with the dedicated angel cards for further guidance and explanation, directly to you from divine transmission, enabling you to have insight and understanding of yourself and circumstances. Throughout my work, you will discover a delicate weaving of a number of ancient and subtle holistic practises, and knowledge that enhance and complement each other harmoniously. All of which, will enable you to access and deepen your understanding of how multi faceted you truly are, and to acknowledge your beauty within. Knowledge and information we acquire from books, but the wisdom and moulding of the soul, comes from life’s experience and interactions along the way. Life engages us to participate along the never-ending pathway, leading us to discover, feel, know and claim our spiritual essence, that is ever evolving and enriching in the bigger picture of enlightenment and eternity. 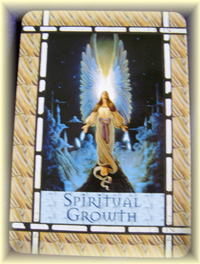 Admiration of the dedicated work of Doreen Virtue Ph.D inspired my choice of angel cards. I have been feeling calmer and happier, more optimistic than before the reading. It has revealed to my consciousness, various insights that were deeply buried in my subconscious, I fell as thou I am really believing my ‘self’ at last. Felt a gentleness surround me on a soul level. The compositions have brought a feeling of being cocooned and energised by the deep sense of unconditional love that surrounded me. Aura readings are held at a beautiful location in Dunvant on the edge of the Gower peninsula and at various times of the day or evening and on Saturday mornings for convenience. Group bookings are available in your area by arrangement when possible. Natural spiritual healing assists and strengthens the belief, that divine love and light energies are there for anyone, to connect with and acknowledge, for healing support, comfort, reassurance and well - being. As a naturally gifted spiritual healer of many years, and also registered with the Healer Practitioner International Association, I provide healing sessions that are spiritually, intuitively guided to assist you. Reiki is an ancient healing system, based on channelling pure universal energy – reiki- through the hands of the practitioner. It is a natural healing art with origins in Tibet and is over 2000 years old. The system of healing was rediscovered in Japan in the 19th century by Dr Mikao Usui, who dedicated his life to the traditional oral teachings, adding spiritual concepts to be integrated with the physical aspects of the reiki energy, and passing on the ability to channel reiki through sacred attunements given by Master to student. As a spiritual healer, it seemed the most natural course of events for me to question developments that were occurring within my healing work, leading me to look more closely into the various applications of channelling spiritual energy for healing. These enquiries were instrumental in my studying this oriental practice. After a period of three years apprenticeship, I received attunements to Master/Teacher level in August 2000. Although I maintain my commitment to the discipline of reiki healing as part of my therapy services, see my website www.soundhealingtherapies.co.uk for more information. Rather than being a master facilitating attunements in the initiation of an individual into the practise of reiki, following the traditional way of teaching, I see myself more as someone who through my own spiritual guidance and journey, now provides through the medium of sacred sound resonance and various natural healings crafts, support for you seeking and wishing to gain more insight and understanding of spiritual awareness and practice. I play a small part in facilitating your journey of self – discovery, enabling maturity of your truth and understanding, bringing clarity and wholeness enriching the soul, for personal enlightenment of the consciousness of divine energy within and around us. I provide Reiki healing sessions. The life force energy induces a deep state of relaxation, supporting the body’s own innate healing process. Treatment time lasts on average, one hour with time to rest and ground oneself before leaving the therapy room. Chanting is the vocal expression of sound at a certain pitch or pitches, and techniques such as overtone chanting, coupled with meditation, have therapeutic powers by establishing and maintaining the tuneful harmony between human and heavenly existence. Characteristic of many of the traditional chant is a deeply felt spirituality, and the belief in the power of sacred sound to create changes in everyday life. The chants in my healing sessions, are a form of healing energies, that are intuitively felt and offered to you the client. As a spiritual, medium and sound healer, I work on the principle of receptiveness and key into your needs, composing a chant that aligns with your own unique vibrational frequency of resonance. Your mind/body respond to the overtones sounded, by locking in or entraining, and begin to vibrate and align at the same frequency, helping to restore natural balance and resonance. The therapeutic session has a powerful effect, and takes you on a sound journey. Some people experience the opening of a gateway to another reality of inner awareness. My chanting sessions last approximately one hour, with time for you to rest and ground and confer if need be. My healing chant sessions are held at a beautiful location in Dunvant on the edge of the Gower peninsula, and are available on various days of the week of each month and Saturday mornings for convenience. For more information and to make an appointment, I can be contacted on Tel: 01792 290458 or email: faithcomplementaryholistics@yahoo.co.uk. One to one tuition in spiritual development that meets your desired level. A consultation is necessary to discuss and arrange a programme of tuition, to meet with your aspirations of your spiritual journey. Benefiting from years of study with medicine elders from the Americas, much of my work is of Native American Indian origin, and of eastern influence, reminiscent of ancient practice and is reflected in the spiritual guidance I receive in assisting others on their pathway in life. Having been spiritually and intuitively guided to work with my own voice for self healing, after a near fatal accident in 1998, which proved fundamental to my overall recovery both physically and emotionally, was to be instrumental in me developing a number of sound healing therapeutic techniques, see my website: www.soundhealingtherapies.co.uk The healing benefits of these techniques, inspired me to want to share with others, not only therapists but anyone who was interested in working with sacred sound for their own healing. If I had been able to focus on the divine presence within the voice itself, and having been witness to the transformational healing within myself, then I truly knew, I was being spiritually guided to commit to following my instincts of then wishing to provide and facilitate, Inspirational Sound Healing Voice Workshops for the community. I knew spirit wished for me to speak of what I had experienced, and heighten the awareness to others of the wonder of sacred sound for healing. I had not survived by chance. My guardian angels and spirit guides had been there every step of the way, showing me the way forward through this major challenge in my life. I bring to my workshops, the enthusiasm and understanding for light hearted exploration, in a friendly atmosphere, helping others explore their deep levels of self, and release an untapped source of vibrational energies of sound of their inner landscape. Providing a sacred space for anyone who wishes to develop, and engage with the sacred sound resonance of their own creative voice for healing, whilst in the process, enhancing personal development, confidence building, expression of the creative self and enhancing your spiritual awareness. In small groups and supportive environments, lifting your perception of the creative alchemy of your voice and its’ potential, and working with sacred tone instruments for well being. The workshops help bring people together in the spirit of community, with the opportunity to create transformation, and improve your health and the health of others, whilst forging knew friendships along the way. Workshops to explore and discover your soul’s signature note. Learn healing techniques and experience the wonders of a sound bath.The workshops are a blending of teachings from Celtic, North & South American Indian & Eastern cultures, and of my own interpretations and practice. 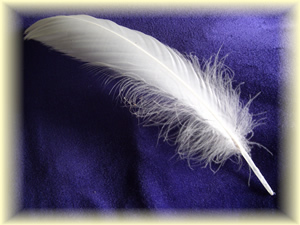 Email: faithcomplementaryholistics@yahoo.co.uk www.soundhealingtherapies.co.uk to check updates of workshop activities.